ROOF TOP PATIO & DOWNTOWN VIEWS! Located in Sunnyside, only steps from DT, LRT & Kensington district. 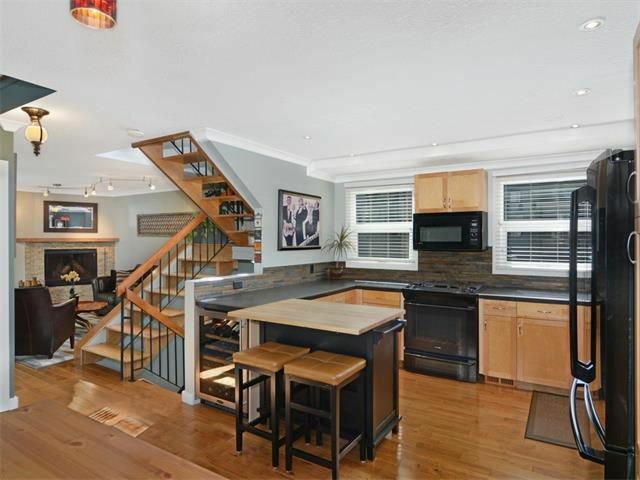 Incredibly private townhome surrounded by beautiful gardens & mature trees. This 3-storey END UNIT FEATURES over 1600 sq.ft. of developed living space. RENOVATED. The open floor plan is airy & bright w/gleaming HWD throughout, 3 bdrms, laundry, dev bsmt, HE Mechanical & 3rd Flr loft. The LR boasts lg windows, fireplace & French Doors that open up onto the outdoor living space. The kitchen / dining room are open & spacious, great for entertaining! Upgraded appliances incld: duel-fuel Gas stove, Marvel bar fridge, Electrolux Fridge & Blomberg DW. The 2nd flr includes 2 spacious bdrms & Full bath w/ heated floor & soaker tub. Retreat to the 3rd flr LOFT which makes for a relaxing TV room or Home Office. Enjoy a morning coffee or evening cocktails surrounded by the sparkling lights of the city on your own PRIVATE ROOF TOP PATIO! Bsmt developed: bed, bath & laundry.